LONDON — An enormous cache of historical documents from Britain's royal archives detailing the reign of King George III is going online Saturday as part of the royal family's effort to rehabilitate the legacy of the monarch widely regarded as having been insane. The monarch — America's last king — is often referred to as "mad King George." He was Britain's longest reigning king, ruling from 1760-1820. He suffered from a rare inherited blood disorder, porphyria, which comes with symptoms including insomnia, high blood pressure, sensitivity to sunlight and confusion, which during George's lifetime were seen as signs of insanity. The portal goes online with the endorsement of Queen Elizabeth II, as part of a five-year project to digitalize 350,000 documents in the archives' collection of Georgian papers. One of the key documents is a handwritten draft letter of abdication that the king wrote in 1783. Heavily marked with corrections, the letter was written during a political crisis caused by the difficulties in forming a government. Referring to his apparent inability to resolve the crisis, the king writes: "I am therefore resolved to resign my crowns and all the dominions appertaining to it to the Prince of Wales, my eldest son and lawful successor." The abdication letter was never used. The documents also show a keen interest in the 1775-1783 American revolutionary war to overthrow British rule in 13 American colonies. The U.S. declared independence on July 4, 1776. So far only 15 percent of the Georgian collection has been published. By 2020, the archives plan to publish the entire collection at www.royalcollection.org.uk/georgianpapers . 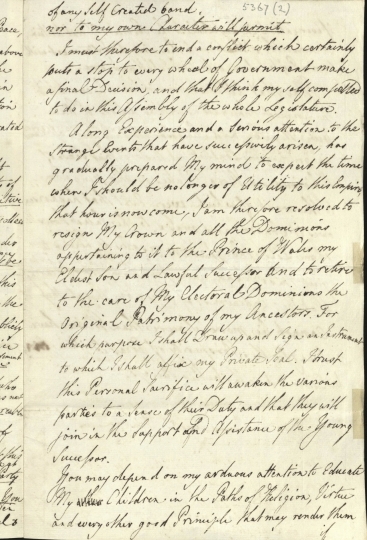 Included in the whole collection are letters between King George and Queen Charlotte, and to his government, as well as notes about the American war, a guide to "kingship" for his son and letters to relatives during his bouts of illness. Prince Charles, the current heir to the British throne, has said that George, who led Britain through six decades of war, political upheaval and industrialization, was misunderstood.